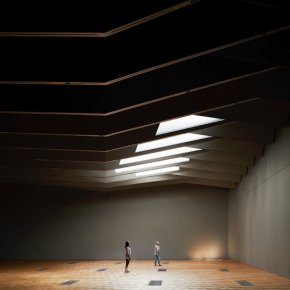 Following the development of the new Sainsbury Gallery as part of the V&A Exhibition Road Quarter, a UZIN system was used to install the ‘herringbone’ wood floor. The 1100 square metre Sainsbury Gallery is one of the largest temporary exhibition spaces, excavated 18 metres below ground. UZIN was chosen by flooring contractor Architectural Flooring Specialists to provide fail safe installation systems. The company also offered technical service and back up throughout the installation. The floor required protection from residual moisture within the concrete substrate, which was provided by UZIN PE 404, resin DPM. The UZIN PE 280 rapid drying primer was then applied to the floor before UZIN NC 150, a heavy duty smoothing compound. Finally, the UZIN MK 92 wood adhesive was used to install the herringbone parquet floor, creating an outstanding and striking atmosphere for the new gallery.